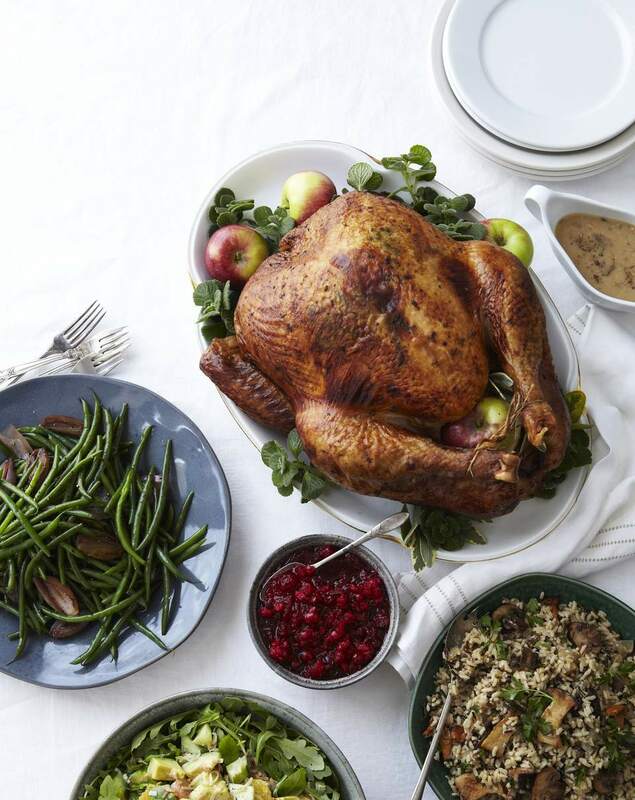 Cooking Thanksgiving turkey doesn't have to be a difficult undertaking. But everybody still makes a big deal about it. Every Thanksgiving, all the food magazines come up with new techniques for how to cook a perfect turkey. There's brining, flipping the bird upside down, cooking in a bag, injecting with a flavor solution, deep-frying, grilling, rubbing butter or oil under the skin, cooking on a beer can, wrapping in bacon, spatchcocking, Crockpot cooking and just plain, old-fashioned roasting. Why so many methods? What's the big deal? Read on to discover everything you need to know for cooking Thanksgiving turkey perfectly every time. Why is Cooking a Thanksgiving Turkey So Difficult? For starters, turkey is pretty lean. Fat is what adds moisture and flavor to meat, and turkey doesn't have a lot of it. So even if you don't overcook your turkey, it can still be dry and bland. Secondly, the thing is just so darned big, cold and heavy. Handling a raw turkey is rife with opportunities to contaminate your kitchen. Open the packaging, and what happens? The bacteria-laden juices flow right out. Then there's all the unwieldy things you do to prep the turkey, whether it's washing it, rubbing butter under the skin, flipping it upside down or just stuffing the cavity. Third, turkeys take up a ton of room in the refrigerator and the oven. It's hard to get other things in the fridge when you're defrosting, brining or even just storing a fresh turkey. The same goes for the oven. Why Do Experts Recommend Brining a Turkey? Brining, the process of soaking the turkey overnight in a salt water solution, is designed to make the turkey moist. When you brine a turkey, you're trying to get the turkey to retain moisture to make it more flavorful. The benefit of a brined turkey is that it can withstand overcooking better than a regular turkey. Why? Because it has the extra moisture to keep it from drying out. Why Do People Cook Turkey Upside Down? When you think about it, a turkey is the absolute wrong shape for roasting. You know how when you're making cookies you're supposed to make them the same shape and size, so they bake evenly? Well, roasting a turkey is like putting one giant, eight-inch tall cookie in the center of the cookie sheet and surrounding it with a bunch of regular-size cookies, then expecting them all to cook evenly in the same amount of time. The shape of a turkey keeps the breast exposed to heat at all times, while the thighs and legs get less exposure to direct heat. Naturally, the breast cooks more quickly. Worse than that, the breast has less fat, which means it can't help but dry out, while the thighs and legs finish cooking. Some people combat this problem by cooking their Thanksgiving turkey, breast side down. It's not a bad idea. But it's not an easy solution either. For one, you can't get that nice, brown turkey skin when you roast upside down, unless you turn it over during cooking. And turning a hot turkey is not easy. What Deep-Frying, Beer Can Cooking and Other Turkey Cooking Methods? All of those are methods designed to help the turkey retain moisture. Are we sensing a theme here? Many of these methods do a good job of it. But like the roasting upside down method, most aren't easy. Unless you're a seasoned veteran at deep-frying turkey, I wouldn't try it. A bird that big in that much oil is just an accident waiting to happen for a beginner. Grilling, smoking, and beer can cooking have problems similar to flipping. A whole turkey is just too big to handle. Why Rub Butter or Oil Under the Skin? Two words: moisture and flavor. The butter or oil keeps the breast moist, so that even if you do overcook the turkey, it won't dry out as much. Butter and oil also impart flavor, especially if you mix the butter with chopped fresh herbs. What's the Deal With Those Flavor Injectors? Flavor injectors are essentially giant hypodermic needles. The purpose is to add flavor and moisture to the turkey. Browse some of our favorite injection marinades. Why Do Most People Overcook Their Turkeys? For years, the U.S. Food and Drug Administration recommended cooking a turkey to two different temperatures—180 degrees F for the thigh and 165 degrees F for the breast. That almost guaranteed the breast would be overcooked (not to mention a scientific impossibility). Several years ago, the FDA changed its recommendation to 165 degrees for all parts of the turkey. But apparently everyone didn't get the memo, so some folks are still cooking to higher temperatures. Another reason is that people don't account for residual heat. Once you remove a turkey from the oven, you should let it rest. This allows the juices to redistribute and the turkey to finish cooking outside the oven from residual heat. Typically, the temperature of the turkey will rise another 5 to 8 degrees during this resting period. Therefore, professional cooks will often take a turkey out at 160 degrees F, rather than 165 to allow for this residual heat effect. But most home cooks don't. So when you remove a turkey from the oven when the thermometer registers 165, the turkey will end up being cooked to 170 to 175 (thanks to residual heat). And that is basically overcooked. The good news is if you've taken steps to add moisture to the turkey, whether through rubbing butter under the skin, wrapping in bacon or brining, it can withstand being overcooked a little without drying out. Is it Necessary to Baste a Turkey? Basting has its place. It makes you feel like you're doing something to make things happen for the turkey. I get that. It also can help the skin brown nicely. What basting doesn't do is add moisture or flavor to the bird, despite what you might have heard. Basting can also lengthen your cooking time, because you're opening the oven frequently. If you like to baste, I say go for it. It won't hurt much and can help the appearance of your turkey. But if you're busy with other things, skip this step. What's the Deal with Wrapping a Turkey in Bacon? As with rubbing butter or oil under the skin, wrapping a turkey in bacon is a way to add moisture and flavor to the meat. The only drawback to this approach is that the turkey will often take on the smoky flavor of the bacon, which some people find distasteful. On the other hand, some people love it. It's a matter of personal preference. Does Cooking a Turkey in a Bag Work? Yes! Cooking a turkey in an oven bag can result in a much more moist and juicy bird than traditional roasting. The reason? An oven bag is essentially a moist heat cooking method. The turkey juices are retained in the bag, keeping the turkey moist and even enabling it to cook faster. It can be a bit unwieldy to deal with getting the raw turkey in the bag. But once you accomplish that, this is a fairly simple method. Just slice the bag open at the top with a knife, let the turkey rest for 20-30 minutes and transfer to a cutting board as you normally would. What Are the Methods to Brown Onions Without Caramelizing Them?